THE LATE JESSIE ROBREDO , Â first choice as DILG Chief of President Noy Aquino Â could be the best president the Philippines never had. He had the charisma of a Ramon Magsaysay but also Â had the bureaucratic savvy that made him one of the ” best mayors in the world”. His impeccable record in Naga City transformed a sleepy town into a progressive city- with the one difference- it also empowered people. Â His “chinelas” form of government was a toast to his humility and competence as a public servant that shames all who pretend to be so these days. You can spot Â them. The incorrigible trapos -who not only enrich their families- but make sure all attention is focused on them. They are the Â insecure underachievers who substitute propaganda for achievements, press releases instead of inclusive growth. There are conspiracy theories saying Â that Jessie was “murdered” in that ill-fated private plane crash Â in 2012. His office was ransacked by ghouls right after his death- because he allegedly knew a lot about jueteng and drug lords and their military and political protectors. If his hands were untied -Jessie could have been a “game changer”- a sure ball candidate for the presidency in the reformist mode of a Noynoy Aquino in 2016 . Last Friday, (Jessie’s birth date) Congress also finished the official 2016 poll count -and his widow, Rep Leni Robredo – covered by the aura of Jessie was named Vice president of the republic of the Philippines. Only the second woman vice president after Gloria Arroyo. The reluctant lawyer-candidate had one great fear. Not losing the elections. But winning it and be changed from the simple, humble being that all the Robredos have become into something else. Even as a presumptive vice president last week -she took the same public bus to Bicol. Taking the plane with three official companions “would have cost P36,000 total” and Leni would have none of it. She said she also Â planned to use another less expensive office as she found the Coconut Palace fronting the scenic Manila Bay too expensive at a monthly rental rate of almost P500,000.Vice Presidents Noli de Castro and Jojo Binay used it. The Robredos continue to live in their humble abode in Naga City and the small town house in Quezon City. Having a Vice President’s title will not change that. As a Representative while, taking night classes for additional knowledge in San Beda College- Leni reportedly took the MRT like all the suffering masses in god-forsaken Manila. Yes, today, Leni Robredo is just a breath away from the presidency. At 71, president-elect Rody Duterte is the oldest ever. He is allegedly not in the pink of health -and eerily said he will resign of he cannot solve criminality in six months. And there are countless sinister plotters we heard Â among the 60% that did not vote for him who will jump at the first chance to unseat him. Therefore, Leni Robredo is not just a VP but a VIP (Very Important Person). That’s why her close political rival, senator Bongbong Marcos has pulled all stops to block her proclamation. They earlier planned to sue SmartMagic , they called the PCOs operators. Three Hooded Clowns appeared and said there was “technical dagdag bawas” in Quezon province- a comedic effort that could not stand a candle against logic and facts. 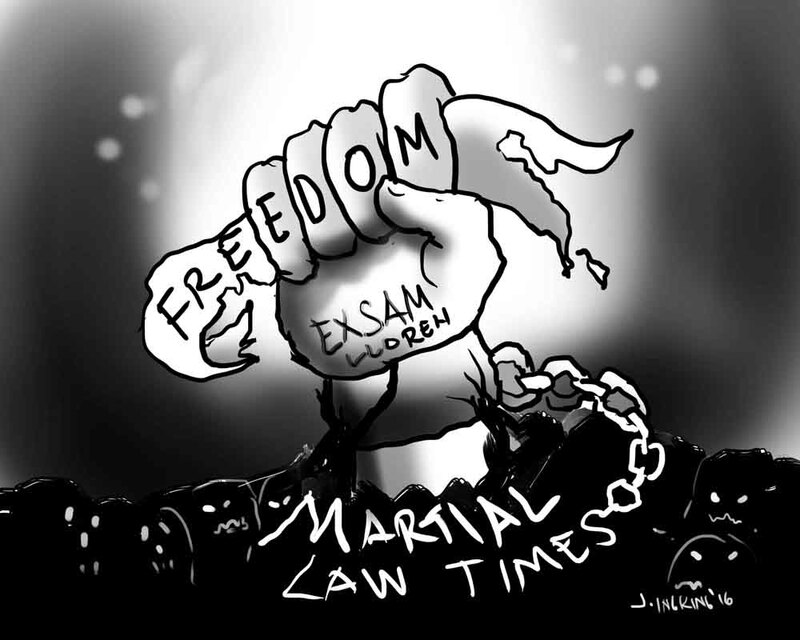 Earlier, a Mindanao State University professor wrote in the Inquirer that the Marcos camp spent P4-Billion for biased revisionists to change the historical appreciation of the dreaded Marcos Regime into that of one- a benevolent dictator. Â They were Youtube experts, bloggers, meme creators, opinion makers and corrupted mainstream media.They almost succeeded since Marcos got 14 million votes. The Post-Duterte garden was too bountiful to pass for them. Election protests in the Philippines for high positions, however,Â are futile. Fifty million pesos and an eternity to wait. Look at Loren Legarda”s case vs Noli De Castro, Miriam Santiago ‘s vs. FVR, Mar Roxas’ Â Vs Jojo Binay Â and know it is troubled waters under the election bridge-then and now. Bongbong can still, of course, run for reelection in the senate in 2019- top it, excel in the Senate and be a viable candidate again in the 2022 Â presidential polls. Automatically, Leni will be presidential material by then. But senator Alan Cayetano (Duterte’s running mate) will make sure he also gets a crack at it. There are talks Cayetano would be senate president and after a year (due to poll rules) will be appointed as Executive Secretary- a powerful insider who will dominate like a “Little President”. We have seen what Allan can do with Duterte. As NP, he made sure the prime post of DPWH seretary went to the son of his Party Â Boss (Manny Villar) – Rep Mark Villar even if such appointment raised valid issues of “conflict of interest” as the Villars are moguls in the real estate business. Cayetano himself admitted as early as 2010 that he had presidential ambitions Â but said ” this is not yet my time.” Perhaps in 2022? In the meantime, the Aquino government was one step short in succeeding in governance .It had great GDP Â growth but no per capita income growth ( income per person). The Duterte administration will hit a home run with both GDP and inclusive growth. According to a renown economist the best Cabinet tool to pursue that goal Â is the little known but potent (NAPC) or the National Anti- Poverty Commission.Given her personality and competence Leni would fit the position to a T – and shine there for the nation to see. But would her rivals give Leni the chance to shine before the eyes of the masses? Leni Robredo certainly does not entertain thoughts about bring president – as she had not being a Vice President . For now, she just wants to be Simply, Leni as Jessie was(with apologies to singer Rex Smith).